The Precision Armament M41Muzzle Brake may not have the “tactical” or “aggressive” look that many 308 AR rifle shooters seem to prefer today. What this muzzle brake does have to offer is proven performance in the field and that is what really matters. 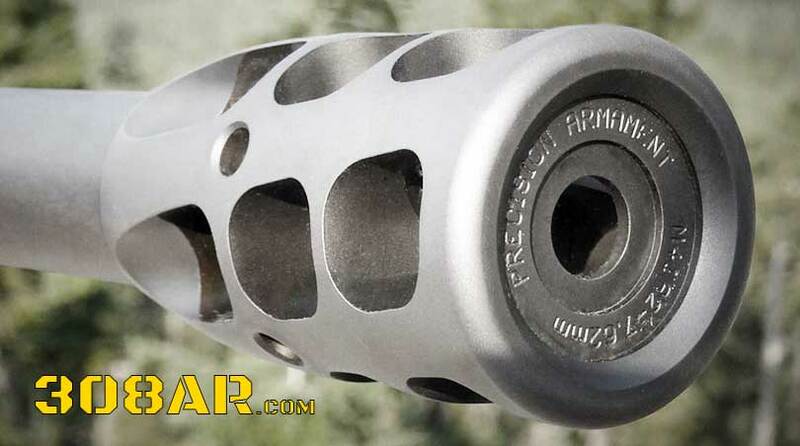 Most Precision Armament M41owners are shocked at how well this muzzle brake reduces felt recoil on the .308 Winchester and .300 Winchester Magnum calibers. You can read many reviews of the Precision Armament M41 muzzle brake at the “learn more” button below. Three large axisymmetric baffles, each featuring five helical ports, redirect a massive volume of gas away from the bore axis in a counter-clockwise radial direction. This not only provides maximum recoil reduction but also reduces the torsional recoil force associated with heavy bullets and fast twist rates. High tolerance class-3 threads machined in same operation as bore aperture ensures perfect concentricity; this combined with a progressively decreasing baffle thickness and maximized venting area significantly reduce bullet flight disturbance resulting in less yaw, higher BC, and improved accuracy. Computer FEA optimized for maximum strength to weight ratio and impact survivability. Precision CNC machined from high strength HTSR 400-series stainless steel bar for superior heat and corrosion resistance. Offered in either an ultra wear resistant DLC (Diamond-Like Carbon) matte black finish, or stainless steel in-the-white, matte finish. This muzzle brake is designed to fit 5/8-24 threaded barrels and can also be modified by a qualified gunsmith to fit larger thread diameters (up to 3/4″ or 18mm).